Virtual Serial Port Driver is designed for emulating interfaces for serial communication, i.e. serial ports. GUI version of this virtual serial port emulator is to be used as a standalone utility, and you can use API to integrate it in another application. Virtual Serial Port Driver PRO is a complete, efficient and adaptable software that is built on the functionality and principle of Serial Port Driver. The program makes it possible to set up serial port bundles as well as set custom parameters, which makes it easy for the program to be useful in a range of scenarios. 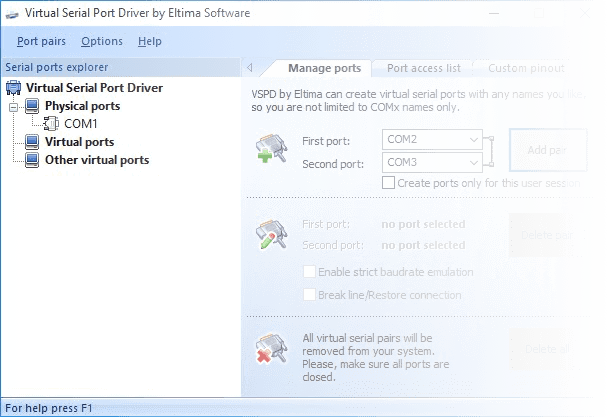 Virtual Serial Port Driver PRO enables you to easily and conveniently manage real and virtual COM ports. The essential functionality of this tool is simulating ports and pairing them via null modem. Apps interfacing via emulated ports interact with each other easily; information passes through null modem connecting them instanteously. This serial port emulator can simulate as many ports as required – the only restriction is your hardware capacity. You can access virtual ports from a Control Panel applet you use for listing all hardware inserted into your computer. Each port can have specific access rights. Apart from keeping your work space free from cables and wires, null modem connections allow data transfer at a higher speed. Thanks to OEM license the null modem emulator can be built into any app. Applications sending data through virtual ports communicate fast and without any hindrance – serial port communication could not be any more efficient. Copyright © 2019 Electronic Team, Inc. and its affiliates and licensors. All rights are expressly reserved. The software programs and accompanying documentation are the copyrighted property of their respective owners and protected by copyright laws and international intellectual property treaties. 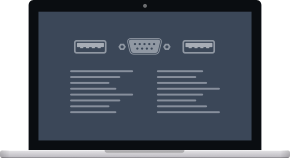 Virtual Serial Port Driver ® and all related product and service names, design marks and slogans are the trademarks and/or registered trademarks of Electronic Team, Inc. and its affiliates and/or its licensors. All other product and service marks contained herein are the trademarks of their respective owners. Any use of Electronic Team, Inc.’s and/or its affiliates’ or third parties’ trademarks or logos without the prior written consent of their respective owners is strictly prohibited.